I Need Therapy is a counselling and psychotherapy practice with lead therapists, Emma Radway-Bright & Sharon Roberts. I Need Therapy is a community-based counselling and psychotherapy practice with lead therapists, Emma Radway-Bright and Sharon Roberts. Our passion lies in ‘bringing therapy to the high street’. Just like you go to your local grocery store, coffee shop or gym, we want our local community to find it really easy to seek therapy. We offer a service that helps people understand the origins of their feelings, thoughts and actions more clearly; and work through their problems and concerns. We don’t offer advice; however we explore difficulties and work towards resolving any issues. We use various traditional counselling methods; and include artistic expression, photography and music, to draw out our clients’ feelings through a medium that suits them. Emma and Sharon (We) met many years ago while studying to become therapists. We quickly recognised that our ethnic and cultural differences complemented the similarities we found in our beliefs and ambitions…We both desperately wanted to make a difference to the people in our community using our best skills – as therapists! We both volunteered for years, gaining experience and giving back to the community but came a bit unstuck when trying to set up our own practice. We spent over a year looking for the right affordable ‘high street’ location. Peckham Levels came along to save the day!! One of our aims is to contribute back to the community as much as we can. We will be offering coffee mornings / workshops to people in our local community who would otherwise not be able to afford counselling or psychotherapy due to income and circumstances. We’d like to offer these to young mums, young men, pensioners and anyone in the community who feels they need a space to meet and talk about common mental health issues. We’d like to offer a service where all people in the community have the opportunity to enter a therapeutic space. We have committed to funding these coffee mornings ourselves. 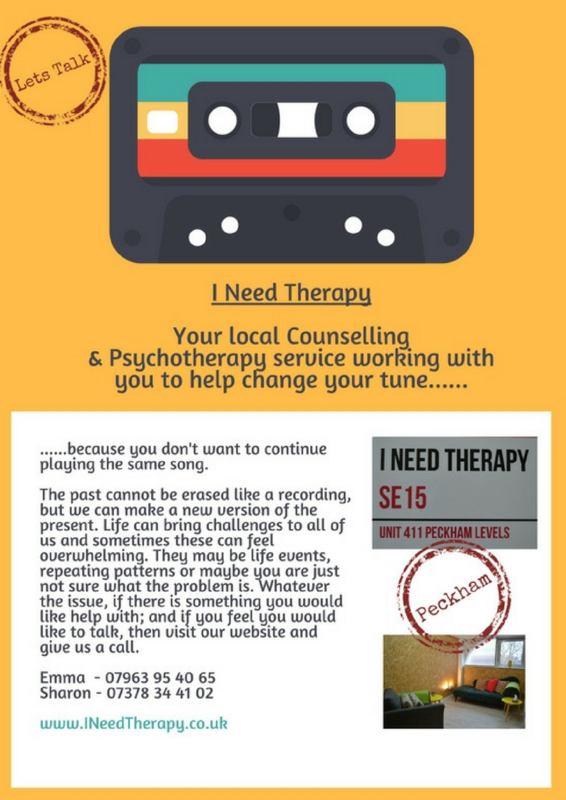 We’re hoping to find a space to do this monthly (using the communal space at Peckham Levels, where available); with a view to encouraging other local therapists to donate their time to hosting special themed discussions.